The outbreak of conflict between armed groups in South Sudan’s Deim Zubier town on the first week of April displaced thousands of civilians to multiple locations in the western parts of the country. Due to the rapid onset of conflict, little is known about the displacement routes or needs of the affected populations. To fill the information gap on the needs of the displaced, REACH conducted a remote displacement tracking in the protection of civilian site in Wau town in Western Bahr el Ghazal State. The displacement tracking provided an initial overview of population movements, the intentions of the internally displaced people (IDPs) and the humanitarian situation of the affected individuals. Data for the tracking was collected from April 18th to May 4th and consisted of four focus group discussions and participatory mapping exercises with 29 IDPs recently displaced from Deim Zubier. The findings by REACH confirmed that the April clash resulted in the displacement of thousands of people from Deim Zubier and surrounding areas. According to humanitarian agencies, Deim Zubier had a population of 7,000 to 8,000 people prior the outbreak of conflict. As of April less than half remained. The displaced have reportedly sought refuge in various locations in Raja and Wau Counties, but have also moved further to Aweil Center and East Counties, Tambura County, Western Equatoria, and crossed the border to the Central African Republic. As noted in REACH’s assessment, the displaced populations reportedly consist mostly of women and children. Several interviewees recounted choosing to travel through dense forests by foot due to the fear of armed groups patrolling the roads. These journeys resulted in several days spent with limited access to safe drinking water and adequate food. REACH found that IDPs seeking refuge in the protection of civilians site in Wau were in the need of food, shelter and non-food items such as mosquito nets. Meanwhile, those who fled to the forests remain trapped due to ongoing insecurity which has resulted in restricted movement. Populations remaining in the forest continue to face limited access to food, water and shelter. As the seasonal rains approach, displacement and insecurity are likely to prevent crop farming in Deim Zubier. Furthermore, the lack of seed stocks, the volatile security situation and continued displacement of populations are likely to discourage cultivation and exacerbate the humanitarian situation in a region that is already facing acute food insecurity. 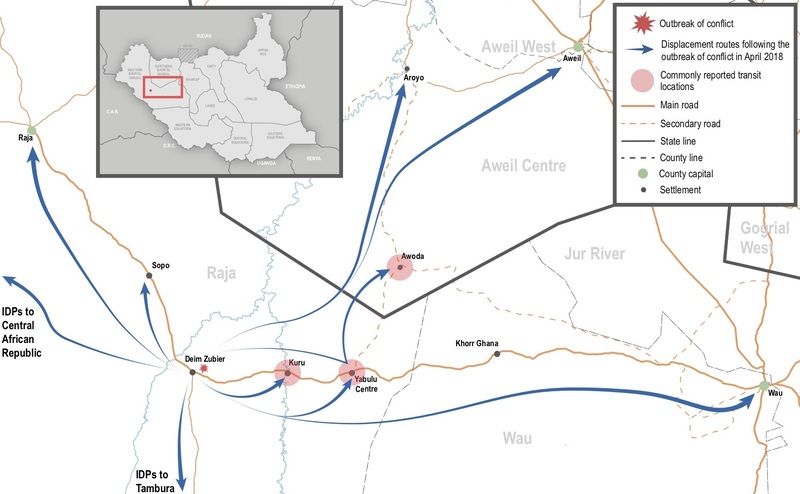 For a more comprehensive overview of the findings from the assessment, visit South Sudan’s page on the REACH Resource Centre and read the full Deim Zubier Rapid Displacement Brief.